The State Bank of Pakistan has published the list of Branch IDs of all e-Branches for all cities of Pakistan. This is a PDF file. This pdf file is available on website of the State Bank of Pakistan. The State Bank of Pakistan has issued a list of 21 e-Branches for Rahim Yar Khan City as shown in the following figure. You can download the complete PDF list of Branch Ids of e-branches for fresh Currency Notes SMS from the link given below. 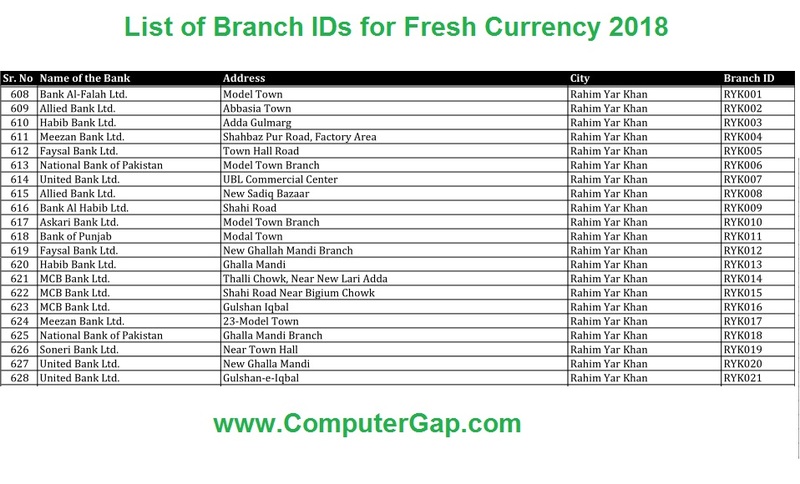 You can download this list of Branch IDs for e-Branches for issuing Fresh Currency to general public.